North Shore Cottage Rental - Beautiful Tropical Surroundings! *Beautiful Tropical Surroundings - Two miles of white sandy beach where you can walk out into the calm waters surrounded by a reef. 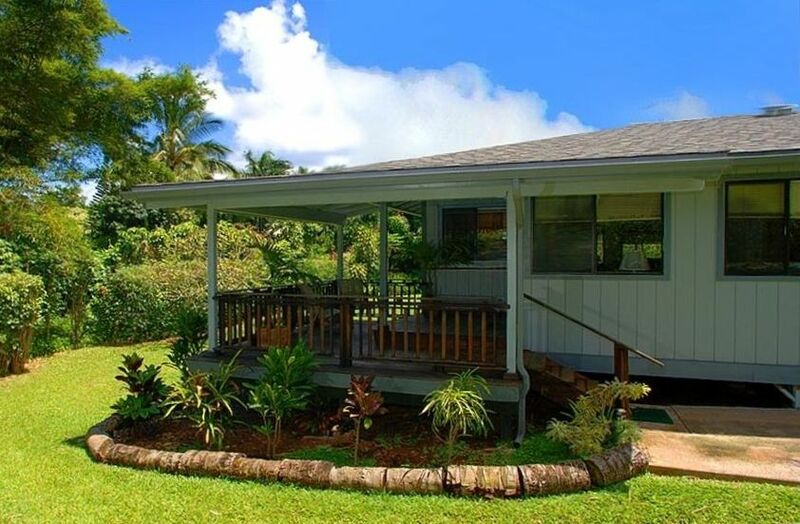 Our cottage is ten minutes to Hanalei with its local Hawaiian flavor, restaurants, and shops. Just ten minutes to the start of the majestic Na Pali Coast - don't forget to take that boat trip - where the 3000 foot cliffs fall dramatically to the ocean below, where waterfalls cascade down into the azure blue of the ocean. Quick 5 minute drive to the beautiful Anini Beach! There are stairs that lead up to the main entrance. The Blue Anini House was just perfect. It was a great place to stay and fit all our needs. Plenty of room with a great BBQ. The lanai was welcoming and so comfortable. This is truly a great place to stay. Home was clean and charming. Bathroom is off dining room not bedroom? Easy beach access just down road. My wife and I had a great time staying here and would definitely recommend it to others. My wife and I have stayed in owner-rented properties throughout the US, Europe, and Japan. This was by far the most well-equipped, convenient, cleanest, and pleasant place we have stayed. We are enthusiastic in recommending it to others, and hope to be able to stay there again. It provided a private setting close to Anini Beach, yet is close to shopping at Princeville and close to other attractions. The kitchen was very well equipped, making it easy to cook. The dishwasher was a plus, and the clothes washer and drying essential for keeping fresh towels in and semi-tropical environment. Towels, chairs, and umbrellas for beach use were a plus. And there was an excellent grill. A private deck with view of the garden was a pleasant place to hang out in the mornings and afternoons (mosquitoes came out in the early evening). Overall, a great experience. Great location. A bit noisy with traffic on adjacent road but otherwise perfect. Comfortable spot great location. Will stay there again! Great location, quiet, comfortable beds! Everything about this place was 'easy'. Very responsive and approachable property manager. Cottage worked well for family of 4.